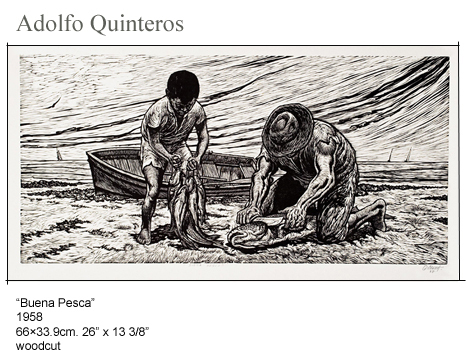 Adolfo Quinteros was born June 1, 1928 in the city of Chihuahua, Mexico. A scholarship from the State Government of Chihuahua enabled him to move to Mexico City to study art at San Carlos Academy from 1951 to 1955. He was a member of the Taller de Gráfica Popular and Secretary General to the Taller, in 1960, and again 1963. He was part of The Mexican Fine Arts movement in 1957 and traveled to Czechoslovakia, USSR, RDA, and Holland in 1959. He co-founded the Jardin Del Arte and its president from 1966 to 1967. He was the recipient of a number of Mexican and International Art Awards.